Ever since I moved my food into the pantry that the hubby made me last year it’s been something of a mess. I’m not used to the wire shelving (which I actually requested for ease of cleaning!) and it’s a rather awkwardly created space to fit in where it needed to fit. Don’t get me wrong, I absolutely love it am so glad that I’m lucky enough to have a real pantry in my kitchen! But there has been a definite need for some organization. So this week as part of my fall cleaning I got serious about tackling the pantry and I’m very happy with how it turned out! 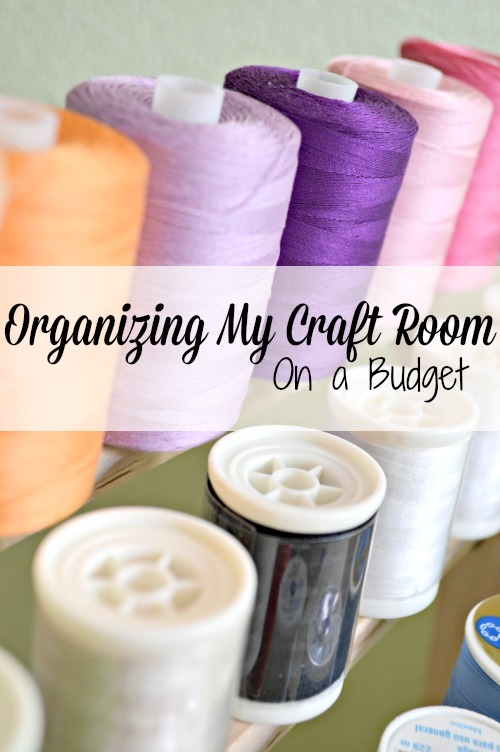 While I’m not the perfect organizer, maybe this post will give you a few ideas on how to organize your own problem area! We always have a good supply of tortilla chips and sometimes some kettle style chips on hand but they are such a mess to organize! I saw some ideas about hanging the bags up and we decided to create our own hanging bag system for these “unorganizable” items in the pantry. all we did was take a shower curtain rod and secure it near the top of the pantry. Then I hung some extra child size hangers from the rod so the bags would hang down to reachable length. Finally we took clothespins and clipped the bags onto the hangers. Now they are up and out of the way and I created a whole extra shelf for other pantry goods! Since I buy much of our staples in bulk, it often comes in bags and I don’t always have a special place to put it when I get it. I took all of the bags and placed the contents into these new Pop Containers from Oxo. I really like the different shapes and how they can stack. I do love storing things in jars but the stack-able feature of these is really nice for smaller items. I also love that these containers seal with the push of a button. Another big problem we’ve had is humidity getting into our foods and making them hard or soggy. Now at least I know the foods in these containers won’t have that issue. I had some larger amounts of dry goods that I placed in these half gallon glass jars. 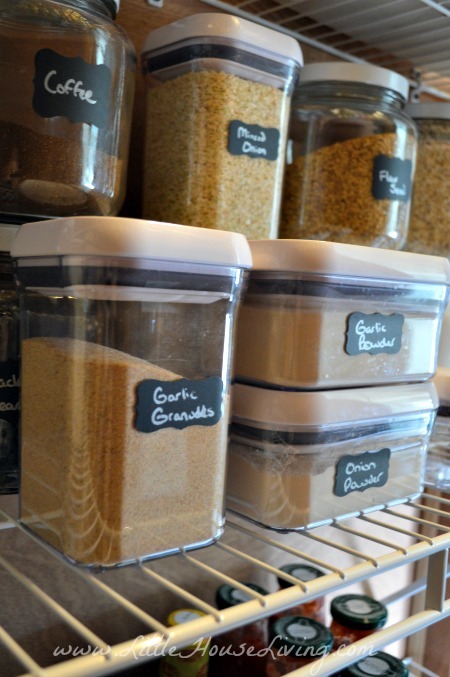 I have some gallon jars that I use for even larger dry goods storage and they work great! 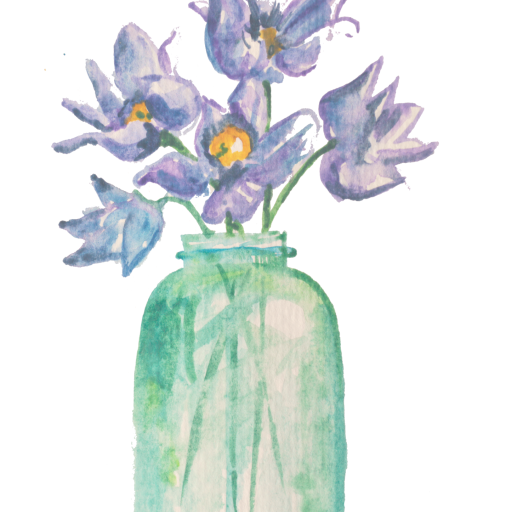 I love glass jars…big, small, any size, they are all good! After all this cleaning I actually had room for my homemade jar mixes in my pantry (plus room to spare!) and of course I put my large bulk items (for us that’s raw sugar, dried beans, and rice) in food grade buckets with Gamma lids on the floor. Now I have much more space in the pantry and I didn’t even get rid of anything, it’s just clean! Amazing how that works isn’t it? Plus now it’s much easier to fit our dehydrator, meat grinder, and some other kitchen appliances in here whereas we didn’t have much space for them before. *This post is sponsored by OXO, however any and all thoughts and ideas on the product or anything else mentioned in this post are my own. A nice difference! I love the idea of hanging the chips,,I don’t store many of those,but I already have a rod in the pantry! I am going to do some thinking as to what else could hang up alongside chips. As usual,another great idea!! I was thinking I could hang some of the smaller bagged items but I ended up having plenty of room for them on the shelves for now, it’s a possibility for the future though! Looks great!I wish i had a pantry in my kitchen. I just have my regular kitchen cabinets and then we put storage shelving in our basement.I like to buy as much of our food in bulk like our dry goods, mixes,and meat for the deep freezer, plus space for my canning jars.I have been doing my fall nesting it feels like! deep cleaning the entire house i want it to be as clean as possible for when we have to spend most of our days inside when its cold. 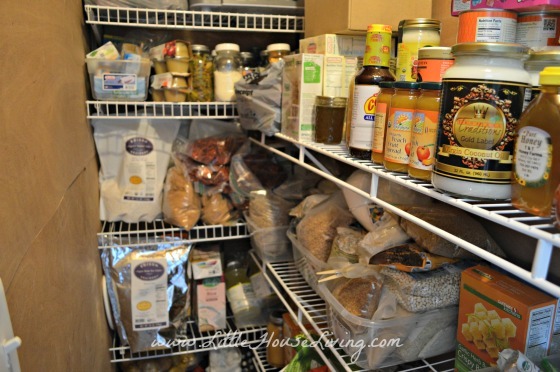 Your pantry looks wonderful!! 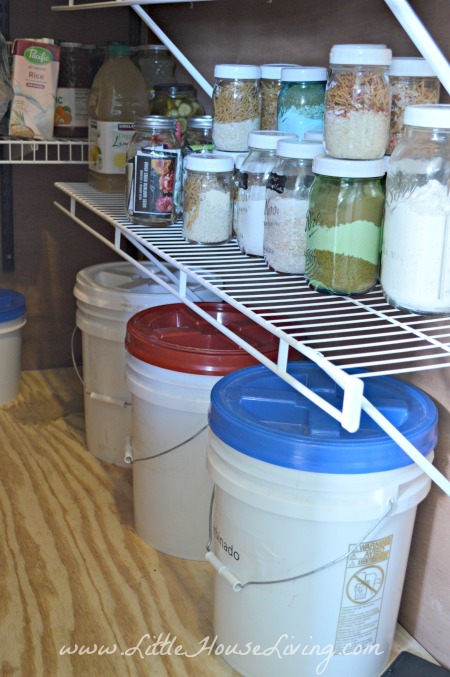 It is nice to see someone else using food grade buckets for food storage. I have several and they really come in handy for bulk storage. Beautiful pantry!!! Where did you get the glass jars with the white lids? I love glass jars too. Love your website and I visit it often. Thank you. I just ordered my first order from Azure. I will have to put the jars in my favorite. Now hitch size do you like the best – the gallon or the 1/2 gallon? I like both of them for different amounts of things. For larger bulk items that I have in a different cupboard (baking soda, brown rice flour, etc) I have in the gallon jars, in the 1/2 gallons we have coffee, smaller amounts of beans, and similar items. I have a pantry that is in desperate need of reorganizing. In fact, it makes your “before” photo look pretty darn good! You have inspired me… thanks for sharing! 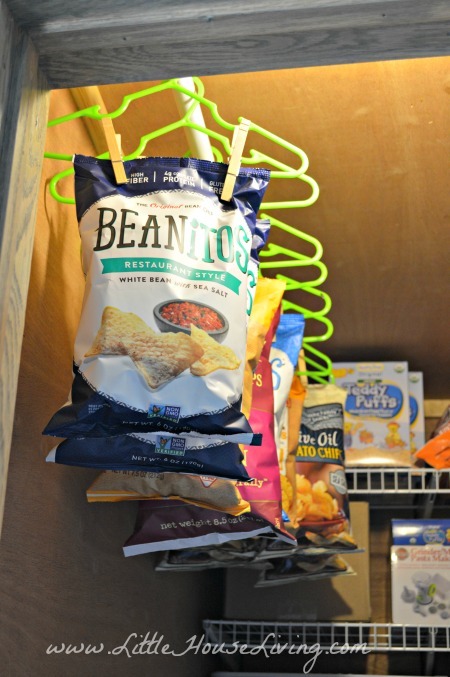 I love the idea of hanging the chip bags! Not only does it keep them out of the way, it keeps them from getting squished! 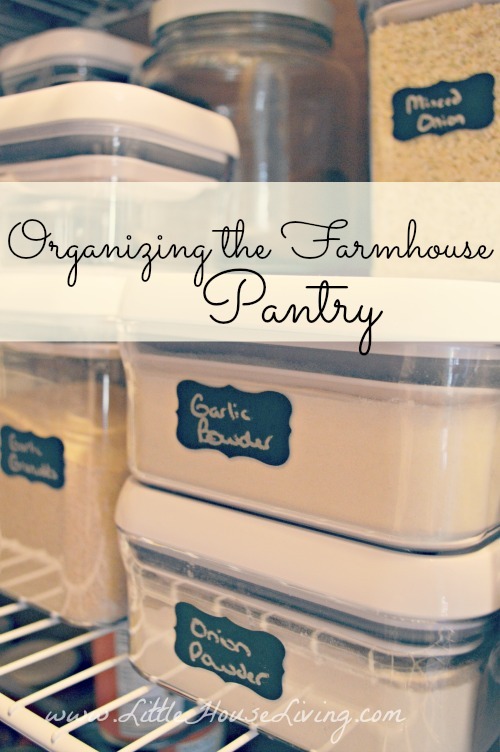 Pantries are so hard to keep organized, Yours looks amazing! Cant’ wait for the giveaway! Wow! Your pantry looks awesome! Love the idea of hanging the bags of chips. I already store a lot of my dry bulk in the pop-top type containers, and just need to get some more. Merissa, what is the depth of your pantry. I love it but ours is only 16″ deep and my husband says it won’t work to do ours like yours. 🙁 I have one entire corner that is lost space since I can’t get into it or see it. Hating on it. The pantry is 5 feet long by 30 inches wide. With 16 inches you could maybe do some deep shelves depending on how it’s set up, they make some neat baskets for shelves too to help with organizing. I have somewhat of a “lost” corner in my pantry too but I just put the things that we don’t need often back there. well, the shelves are 16″ DEEP, so I guess that isn’t deep. Hey, I just had a great idea! Could you put a stick up mirror in your pantry in such a way that you could see stuff you put in that awful lost space? Thanks always for the great tips. In the process of putting our home on the market. Not something I had envisioned ever doing cause I love the house and neighbors. I took care of my Mom for 16+ years, alzeimers took her in July. Can no longer afford our home. Anyway thanks for this blog. Hang in there, Susan. It’s tough, but there is a brand new world waiting for you with your name on it! Love your regrouping! I can use some of the ideas for mine. Thanks for the ideas. Love the hanging chips idea!! 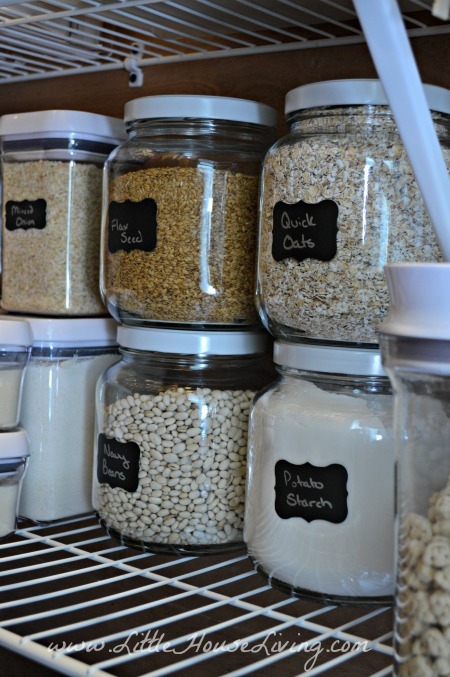 Your pantry looks great and I love all the glass jars you have…I have several, but hope to get all glass and do away with plastic…. I also like the idea of hanging the chips. 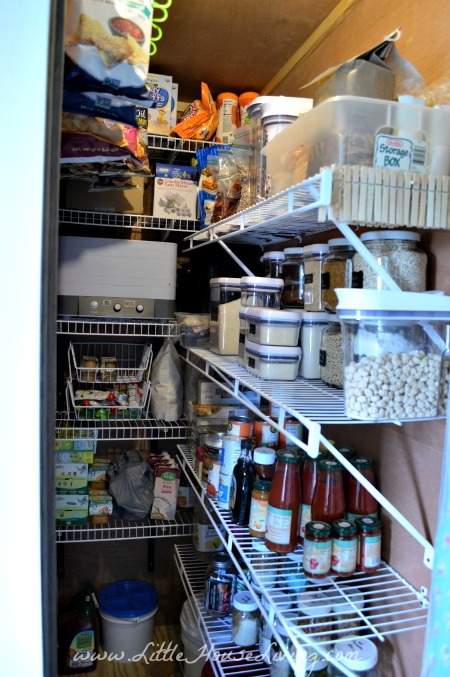 Our pantry is a small room that also serves as a storage area and has our chest freezer and dehydrator. It is so easy to just throw things in there and shut the door, saving a mess for another day. Because of this the pantry is on our cleaning list nearly every day and is a ‘hot spot’ area (flylady). Thanks for the chip idea! 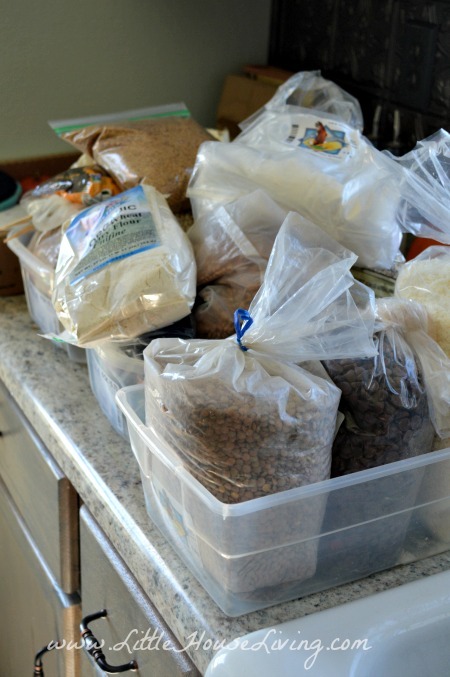 Love your pantry organization ideas. Have you checked about getting plastic shelf liners for your wire shelves? You may need to cut them to size. I know they have some that are 18 inches deep. Loved your jars and storage ideas! This may be on another blog of yours, but where did you get your labels? I found them here on Amazon.